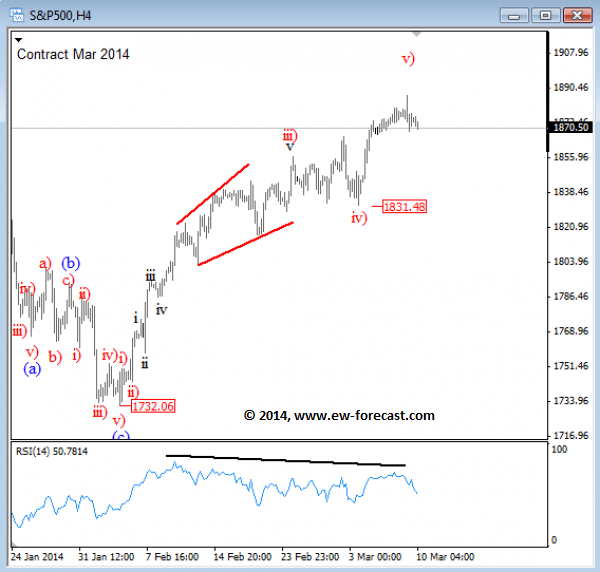 S&P 500, crude oil and gold risk-off coming? On the S&P 500 (CME:ESM14) we should be aware of a bearish turn after a divergence on the RSI which is an early sign that price is in final stages of an impulsive advance. We also need to keep an eye levels from a daily chart where price is approaching serious 1900 psychological level that may react as resistance so it may be the right time to be aware of a bearish reversal. An impulsive sell-off back to former wave iv will confirm a trend change. 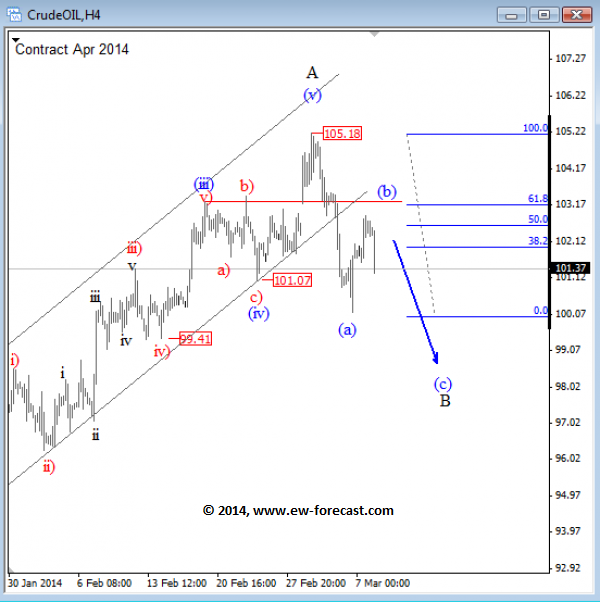 Crude oil (NYMEX:CLJ14) has turned nicely to the downside from around 105.00 area last week where we were looking for a top formation in wave A after a five wave rally from January low. Notice that current decline is very sharp and impulsive that has extended beneath the trend-line of recent upward channel. At the same time we have also seen push beneath wave four 101.07 support that is the most important evidence for a trend change. As such, we are looking lower now for a big three wave retracement that should resume soon after recent wave (b) retracement up to 103.00 resistance zone. 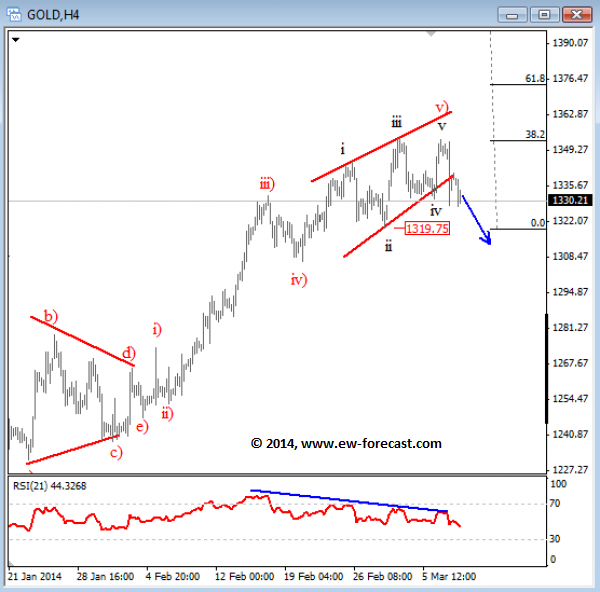 Gold (COMEX:GCJ14) re-tested the highs at the end of last week at 1350-1360 resistance area from where we have seen a new sell-off, but this time it can be much stronger if we consider the possibility of an ending diagonal placed in wave (v). Price however turned down on Friday after NFP report, so to make sure that trend has changed and that it was not just news effect, we need more evidence for the bearish confirmation. It would be nice to get a daily close beneath 1319 support to confirm further weakness. Bearish divergence on the RSI also suggests limited gains for the metal.